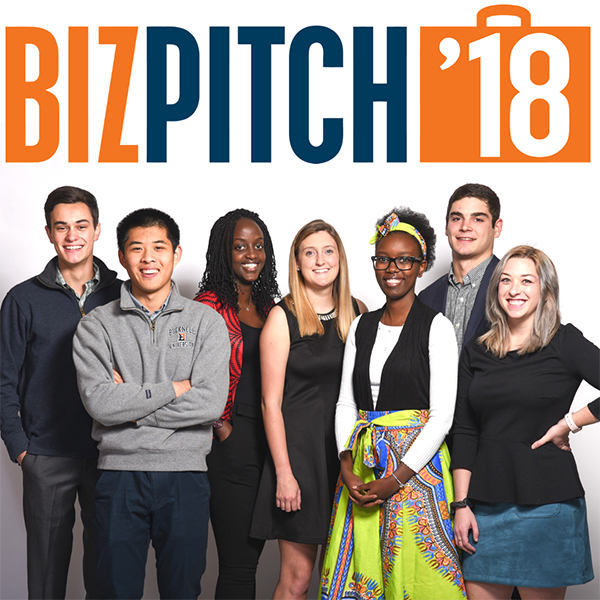 The Bucknell University Small Business Development Center (SBDC) will host the BizPitch 2018 finals on Tuesday, Nov. 13, at 5:30 p.m. in the Terrace Room, which is located on the second floor of the Elaine Langone Center. BizPitch is an annual competition held every November during Global Entrepreneurship Week giving student entrepreneurs the opportunity to win monetary prizes to help them launch their startup business ventures. Students connect with advisers, access resources throughout Bucknell’s entrepreneurship ecosystem, and secure membership in StartupLewisburg, Bucknell’s home for innovators in downtown Lewisburg. The Nov. 13 BizPitch finals will feature this year’s student finalists (pictured), who will pitch their startups to a panel of alumni judges in a competition for over $5,000 in prizes. The event is modeled after the popular Shark Tank television program.